Matlock owes its importance as the county town of Derbyshire primarily to two men. The first, John Smedley (1803-1874), was a local hosiery manufacturer who made a recovery from typhus at the age of forty-three at the newly-opened Ben Rhydding Hydro near Ilkley. He felt he owed his life to an innovative form of water-cure, hydropathy, a system of baths, compresses and treatments in mineral-free water to expel morbid impurities from the body through “putrescent excrescences”. He underwent a religious conversion which led him to encourage temperance through the promotion of hydropathic “cures”, which he promoted as an “entirely an original system, not the cold water cure”. In 1853 he bought a small private medical establishment serving six patients and developed it into the huge Smedley’s Hydro on Matlock Bank. After his death the business was incorporated as Smedley’s Hydropathic Company Limited, with capital of £25,000. The buildings were repeatedly extended until by the Edwardian period Smedley’s had 300 bedrooms. The opulent architecture of Smedley’s Hydro reflects the gradual relaxation of its founder’s strict temperance regime: tobacco, cards, billiards and dancing were introduced over the years, and the iron-and-glass Winter Garden of 1900 was built with a dance-floor. What John Smedley had intended as a therapeutic establishment open to all classes gradually became a high-class hotel for those who could afford it: eventually there was actually a licensed bar on the premises. The comfort and luxury of Smedley’s in the early twentieth-century was a long way from its founder’s precepts banning “books, newspapers, or tracts of an irreligious character”, visitors or receiving letters on the Sabbath. The entire building was taken over at the start of World War II and used as the Military School of Intelligence. Business resumed in 1947, but failed to pick up, and Smedley’s Hydro closed in 1955. At that point the second “father” of modern Matlock stepped in – Alderman Charles White (1891 -1956), the chairman of Derbyshire County Council, who spotted the opportunity to move the council’s offices from cramped sites in the centre of Derby to a huge empty building nearer the geographical centre of the county. Smedley’s became County Offices, and in the 1990s was aggrandised as County Hall. There is a species of rush hour up the bank and across the moors twice a day as hosts of civil servants flit in and out of the town. 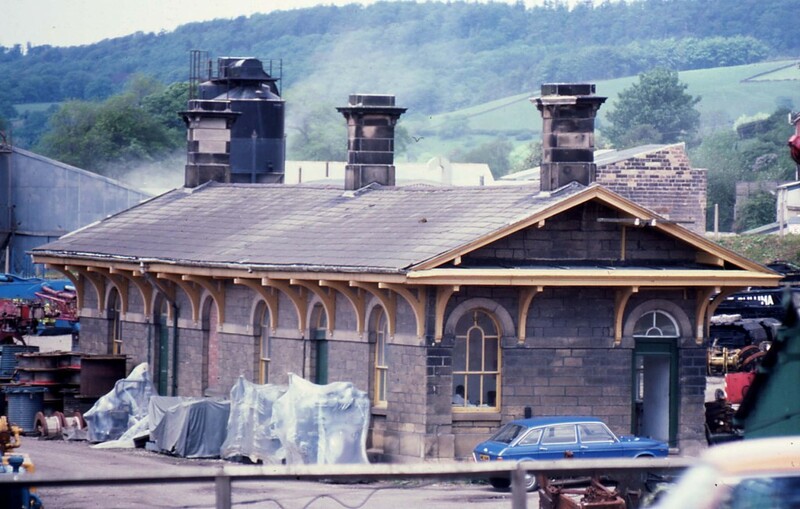 Its position as the county town is no doubt the reason why Matlock retained its rail service as a branch-line when the main line to Manchester closed in 1968. Perhaps it’s also the reason it has a Sainsbury’s. There’s a particularly well-constructed website of Matlock and Matlock Bath history at http://www.andrewsgen.com/matlock/index.htm. 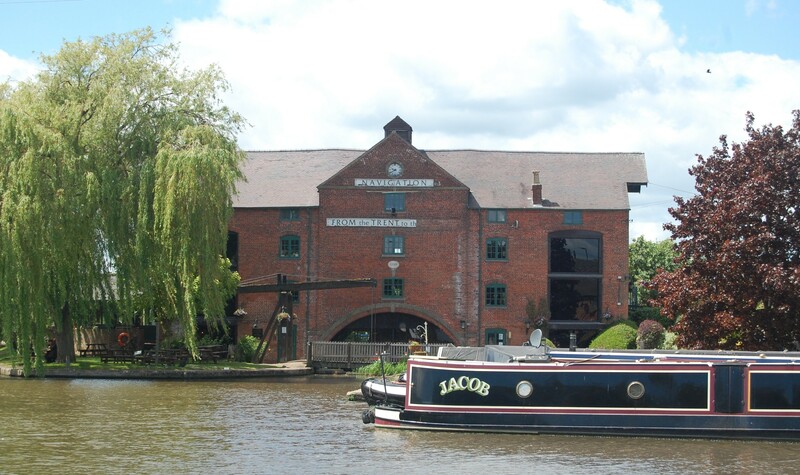 The 72-page, A4 handbook for the 2009 Derbyshire-based Taking the Waters: the history of spas & hydros tour, with text, photographs, and a reading list, is available for purchase, price £15.00 including postage and packing. To view sample pages click here. Please send a cheque, payable to Mike Higginbottom, to 63 Vivian Road, Sheffield, S5 6WJ. This entry was posted in Fun Palaces, Taking the Waters: the history of spas & hydros – Derbyshire, The Derbyshire Derwent Valley, The Derbyshire Derwent Valley 2016 tour, Victorian Architecture on January 15, 2014 by Mike Higginbottom. Driving through the limestone gorge along the A6 through Matlock Bath always has a feeling of being on holiday. 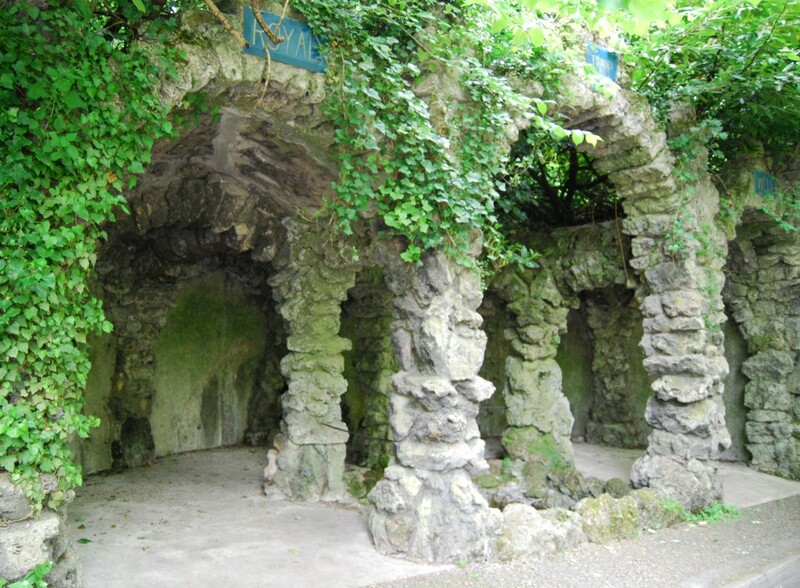 The place has in fact been a resort since the end of the seventeenth century, when a mineral spring on the hillside was developed for the growing fashion for cold-bathing that had already fostered the growth of new spas such as Harrogate, Scarborough and Tunbridge Wells. 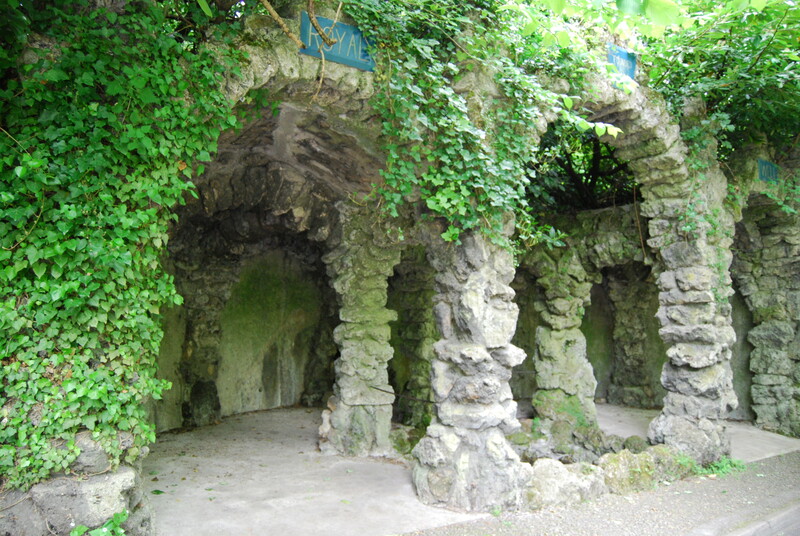 This spring still feeds into a grotto at the back of a public car-park that occupies the site of the Old Bath Hotel, latterly the Royal Hotel, which burnt down in 1929. The New Bath Hotel of 1762-7 remained a hotel where the basement bathing pool is supplied with tepid thermal water from the original spring, until it suddenly closed in July 2012: http://www.matlockmercury.co.uk/news/local-news/employees-and-guests-face-uncertainty-as-hotel-goes-into-liquidation-1-4731341. Further along the valley, the Temple Hotel [http://www.templehotel.co.uk] was built in 1786 alongside the Fountain Baths, which had opened eight years previously. A fourth hotel, known simply as the Hotel or Great Hotel, proved overambitious, and was subdivided in the 1790s into a terrace which became Museum Parade, so named after Mawe’s Old Museum which took over the enormous dining-room. In days gone by, the appeal of Matlock Bath was that it wasn’t Buxton. Though Buxton was anything but grand until the 5th Duke of Devonshire tried to turn it into Bath in the late eighteenth century [see Mary, Queen of Scots slept here, Buxton’s Crescent and Duke’s Dome], Matlock Bath, in a dark gorge with hardly any road access, was much more secluded. Indeed, Dr Hembry relates, when the teenage 5th Duke of Rutland turned up with some friends at the end of the season in 1796 he had the place to himself. Nowadays the main road runs through the dale, and at weekends it’s the resort of bikers, whose gleaming machines are lined up outside the cafés and chip-shops. The black leather gear may look intimidating, but you may be sure the people inside are entirely respectable. Indeed, when my mate Richard bid at a fantasy auction for a ride on a Harley Davison, he found himself whisked off to Matlock Bath for a greasy-spoon breakfast by a hospital consultant. This entry was posted in Fun Palaces, Taking the Waters: the history of spas & hydros – Derbyshire, The Derbyshire Derwent Valley, The Derbyshire Derwent Valley 2016 tour on January 15, 2014 by Mike Higginbottom. One of the finest, and simplest, eating experiences in Derbyshire is the full breakfast at the Grindleford Station Café. Grindleford is the first station westwards on the Hope Valley Line, which carries passenger services between Sheffield and Manchester. This line between Dore and Chinley was a late link in the Midland Railway network, opened in 1894. The station building, like others on the line, is a standard design, built in timber with stone footings and chimneys. It was founded and driven by Philip Eastwood, a man who affected a truculence which would have been noticeable in the grumpiest eateries of Lower Manhattan. His notices are legendary: “Don’t even think of asking for mushrooms”, “Unaccompanied children will be sold into slavery”, “This is a serving hatch, not a gawping hatch” and “If you want to be a fire guard, join the fire brigade”. Inevitably, some innocent customers took exception to this, but astute reviewers recognise that nobody builds a successful business by hating customers. Review comments on http://russelldavies.typepad.com/eggbaconchipsandbeans/2004/07/grindleford_sta.html describe the service as “charmingly grumpy”, “curt but helpful”, “so awful it was wonderful”. The place is so special its Wikipedia entry contains irony: http://en.wikipedia.org/wiki/Grindleford. Philip Eastwood Snr died in 2007 at the age of 63, dancing at a party, and his son, also Phillip, then aged nineteen, promptly gave up his business-management degree-course and his plans for an athletic career to take on the family legacy, much to the relief of the rambling community. The café continues, and Phillip Jnr has added to the notices, but long-standing visitors will sense that the new management has a gentler temperament, and some of the heart has gone out of the truculence. A Sheffield Telegraph writer [‘Station café still on track’, January 13th 2009] even spotted one that ended with the words “Thank you”. For cholesterol-on-a-plate breakfasts and lunches with chips piled high there is nowhere finer anywhere in the Peak District. Don’t use the loo without making a purchase, and if you want to check if the hair-dryer’s still working, ask for mushrooms. 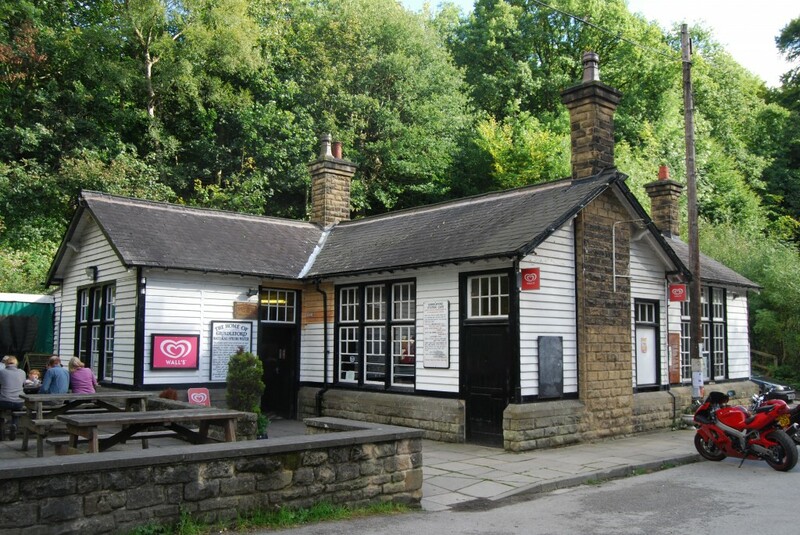 Update: Phillip and Kulbir Eastwood celebrated the forty-fifth anniversary of the Grindleford Station Café on October 27th 2018: https://www.thestar.co.uk/news/how-much-loved-grindleford-station-cafe-has-survived-for-45-years-1-9410432. This entry was posted in Life-enhancing experiences, The Derbyshire Derwent Valley, The Derbyshire Derwent Valley 2016 tour on December 29, 2013 by Mike Higginbottom. My friends Doug and Marion, who share my appetite for life-enhancing experiences, took me to the David Mellor Factory [http://www.davidmellordesign.com/visitor-centre] at Hathersage, in Derbyshire, recently. David Mellor (1930-2009) is a fascinating figure. A Sheffield lad, the son of a toolmaker, he was the beneficiary of an education system that allowed him to begin training at art school in metalwork, pottery, woodwork, painting and decorating at the age of eleven. As a teenage student at the Royal College of Art he designed his first cutlery, ‘Pride’, which was manufactured by the Sheffield company, Walker & Hall, in 1953, and remains David Mellor Designs’ best-selling range. Later cutlery designs include ‘Symbol’ (1963), the first stainless-steel mass-produced cutlery, for Walker & Hall, ‘Embassy’ (1963) for use in UK embassies across the world, and ‘Thrift’ (1965), a further Government commission which combined economy with good design by reducing the number of items in a place-setting from eleven to five for bulk institutional orders ranging from prisons to railway buffets. He made Sheffield his base, and became famous not only for cutlery, but also for Eclipse saws for James Neil, garden shears for Burgon & Ball, and much, much else. Working with the Abacus company, he redesigned the standard British traffic-light and pedestrian crossing (1965-70). He devised a bus shelter that ran to 140,000 units and, at the request of the Postmaster General, Tony Benn, rethought the traditional post-box: his square design was intended to be easier to empty, but encountered much public resistance because it wasn’t round. A letter-writer to the Scotsman newspaper complained that it would endanger passing drunks. His first customised workshop building in Park Lane, Sheffield, was designed by Patric Guest in the early 1960s and is now a listed building. 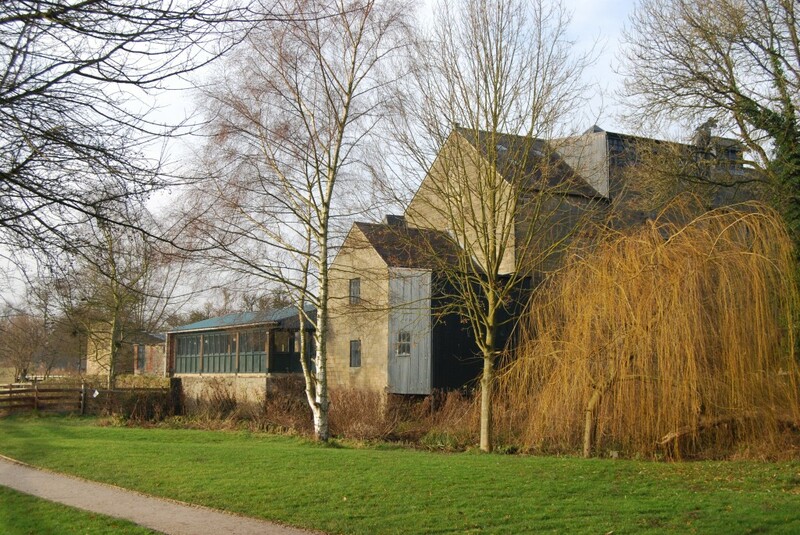 He then took over the derelict Broom Hall, once the home of the Jessop family and dating back to the late fifteenth century, and turned it into a integrated living space and workshop, described in his Guardian obituary as “a rare example of a family house containing a 55-ton blanking press, a 180-ton coining press and two grinding machines”. Then, in 1990, he moved his business out to the Peak District National Park, taking over the site of the former Hathersage gasworks: here the factory, the famous Round Building, was built on the base of the demolished gasholder with a roof derived from the principle of the bicycle wheel, upending the Sheffield tradition of fragmented cutlery manufacture so that the processes were integrated within a single space. The architect was David Mellor’s friend, Sir Michael Hopkins, whose other work includes Portcullis House opposite the Houses of Parliament, the Mound Stand at Lord’s, and the Inland Revenue building and the initial phase of the University Jubilee Campus in Nottingham. 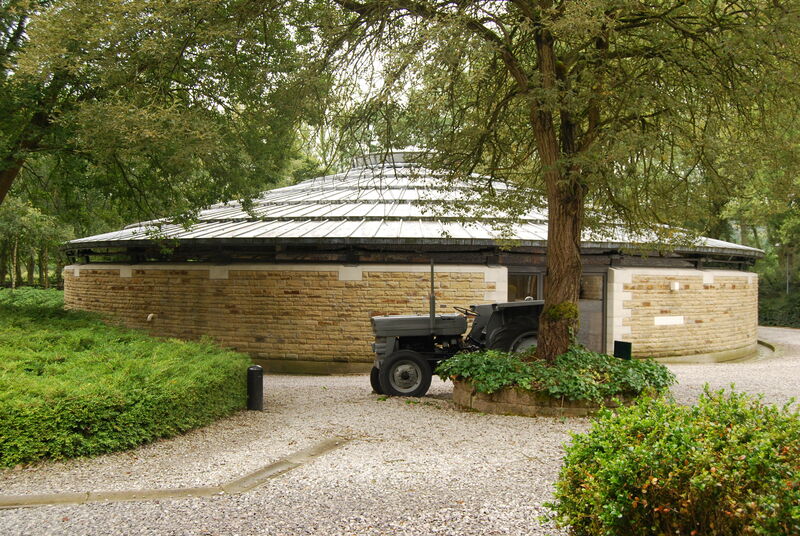 Hopkins returned to Hathersage to convert the retort house and other ancillary buildings on the site into a shop, a restaurant and the David Mellor Design Museum, opened in 2006. David Mellor married Fiona MacCarthy, the biographer: their son Corin Mellor (b 1966) is now Creative Director of David Mellor Design, while their daughter Clare (b 1970) is a graphic designer. The David Mellor Factory is on the B6001 south of Hathersage, just beyond the railway station. The café is excellent and the design museum fascinating; factory tours are held at the weekend. The David Mellor Factory opened a new Street Scene exhibition in September 2013: http://www.bbc.co.uk/news/uk-england-23977482. The most comprehensive account of David Mellor’s life and work is Fiona MacCarthy’s David Mellor Master Metalworker (David Mellor Design 2013). 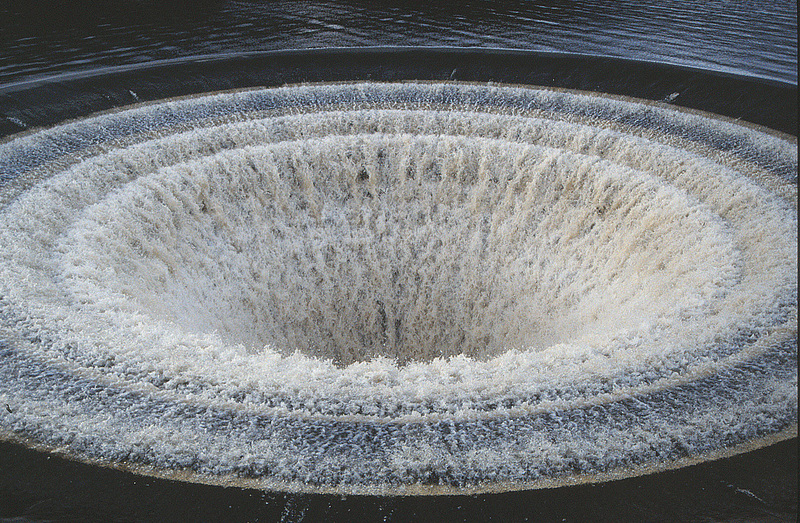 This entry was posted in Life-enhancing experiences, Sheffield's Heritage, The Derbyshire Derwent Valley, The Derbyshire Derwent Valley 2016 tour on December 27, 2013 by Mike Higginbottom. There was a time when Deborah, Dowager Duchess of Devonshire could claim to be non-literary. When her friend Evelyn Waugh sent her a copy of his biography of the Catholic theologian Ronald Knox, he inscribed it “For Darling Debo, with love from Evelyn. You will not find a word in this to offend your Protestant sympathies”, and she noticed that every page was blank – “the perfect present,” as she described it, “for a non-reader”. Her two masterly descriptions of her home, The House: a portrait of Chatsworth (Macmillan 1982) and The Estate: a view from Chatsworth (Macmillan 1990), showed her to be a charming, lucid and informative writer, with an unerring facility for the apt anecdote. Since that time she has written extensively and has published an autobiography, Wait for me! Memoirs of the Youngest Mitford Sister (John Murray 2010), which is characterised by the candour that contemporary memoirs allow, discussing her miscarriages and her husband’s alcoholism, with the comment, “Sixty years ago none of this would have been discussed: it would have been swept under the carpet…in the pretence that it was not happening”. In everything the Duchess writes, and in the interviews she gives, there is a characteristic astute common-sense, tipped with asperity – wondering, in a Sunday Times interview with Rosie Millard [September 7th 2008], if the media reporters who hounded her nephew Max Mosley had dull private lives, and vastly preferring Attlee to Blair among Labour prime ministers. 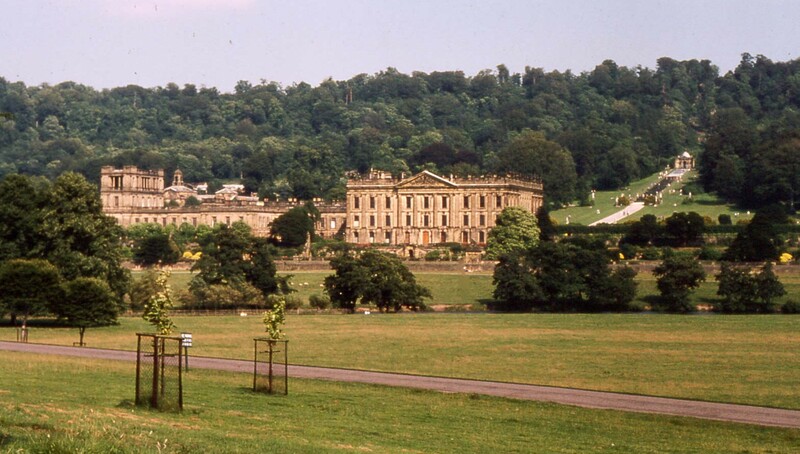 The survival of Chatsworth as a great house and a functioning landed estate is entirely attributable to the courage of Andrew, 11th Duke and to the business acumen of his duchess, Deborah. When Edward, 10th Duke, died in 1950 four months too soon to escape death duties, it would have been an easy option for his son to sell up, pay the 80% duty and live the life of a prosperous publisher. Instead, Andrew Devonshire took the view that he and his wife were “life custodians of what has been at Chatsworth for centuries”: he sold outlying land, handed over Hardwick Hall to the National Trust and gave items from the Chatsworth collection worth four-fifths of the duty owed. The debt on the actual death duty was settled by 1967; paying off the accrued interest took until 1974. Then, with a further sale of a single Poussin and a collection of 69 Old Master drawings, he set up a £21 million trust to maintain Chatsworth. Visitor entry pays about one-third of the running costs; the rest is met by the Chatsworth House Trust. It’s Her Grace’s flair that created the Chatsworth Farm Shop [http://www.chatsworth.org/shop-eat/the-farm-shop], the Cavendish Hotel and Restaurant in Baslow [http://www.cavendish-hotel.net] and the Devonshire Arms Hotel, Bolton Abbey [http://www.thedevonshirearms.co.uk]. When the 11th Duke died in 2004 the title and the Devonshire estate passed to his son, Peregrine, and his duchess Amanda. 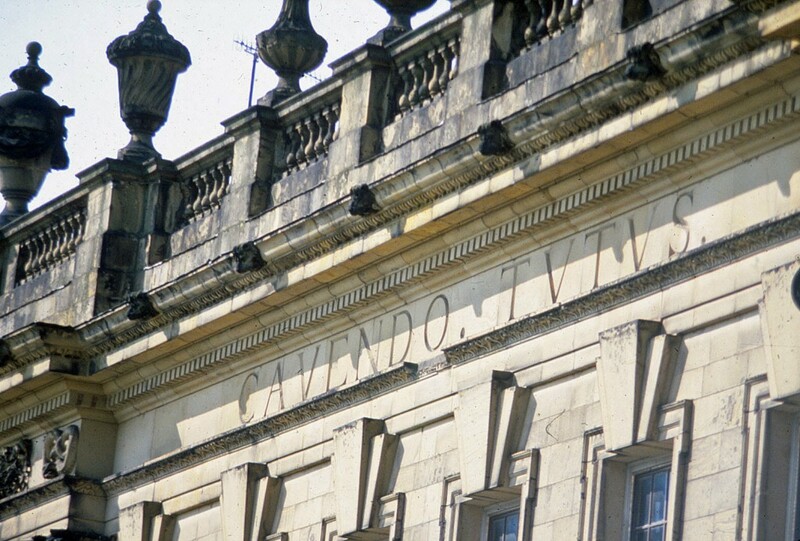 They are now making their own mark on the house and the estate: details of the Chatsworth Masterplan can be found at http://www.chatsworth.org/the-chatsworth-masterplan. 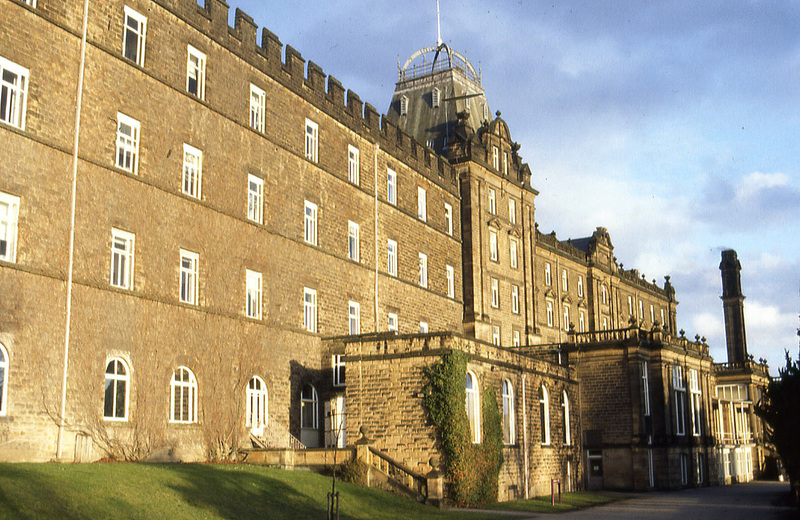 Deborah, Dowager Duchess of Devonshire died on September 24th 2014 at the age of 94, and is buried with her husband at Edensor on the Chatsworth estate. This entry was posted in Country Houses, Life-enhancing experiences, The Derbyshire Derwent Valley, The Derbyshire Derwent Valley 2016 tour on December 27, 2013 by Mike Higginbottom.